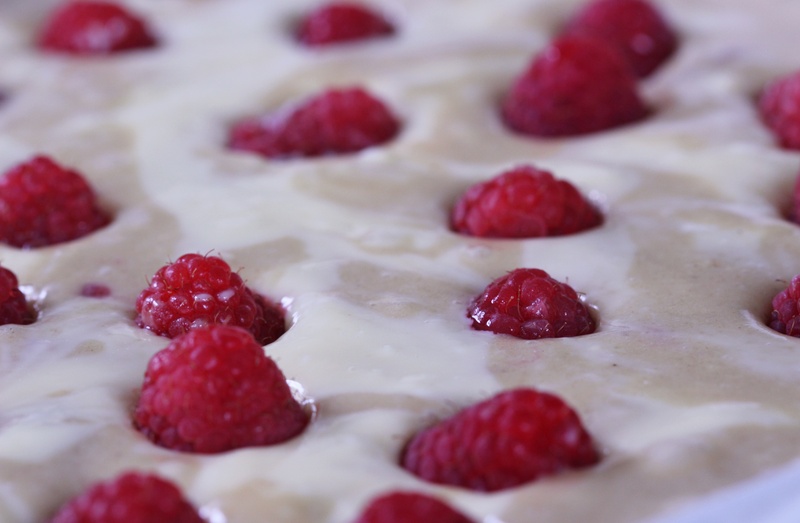 Raspberry cream cheese blondie | dash.drizzle.dollop.devour. I’ve made two batches of this in the last week, that’s how much I like this recipe! I like a big tray-bake to feed a crowd, so it was the perfect choice for this weekend, when we had lots of friends over for a picnic and games on the common, now nicknamed “Tootfest!” I am lucky to have an increasing number of friends living in my local area, a wonderful little community which makes London seem less vast and makes having a gathering like this so much more achievable. The recipe I’ve included here is for a normal-sized square cake that will cut into 16-20 pieces. I doubled this for Tootfest and cooked it in a small roasting pan to ensure we had plenty. I wanted a summery cake, but something that would happily sit around in the heat for an afternoon without spoiling. This blondie has the requisite amount of stickiness to stop it drying out, with the swirl of cream cheese adding a tangy note to cut through some of the sweetness of the white chocolate. Raspberries seemed the perfect choice of fruit to me, but I could imagine that blueberries would also work well. Melt 200g white chocolate with 100g of butter in a bowl suspended over hot water. I prefer to use this method of melting for white chocolate which always seems much more temperamental than regular chocolate. Make sure the water doesn’t boil or touch the bottom of the bowl. Once melted put to one side. Crack 3 eggs into a separate bowl and add 260g caster sugar. 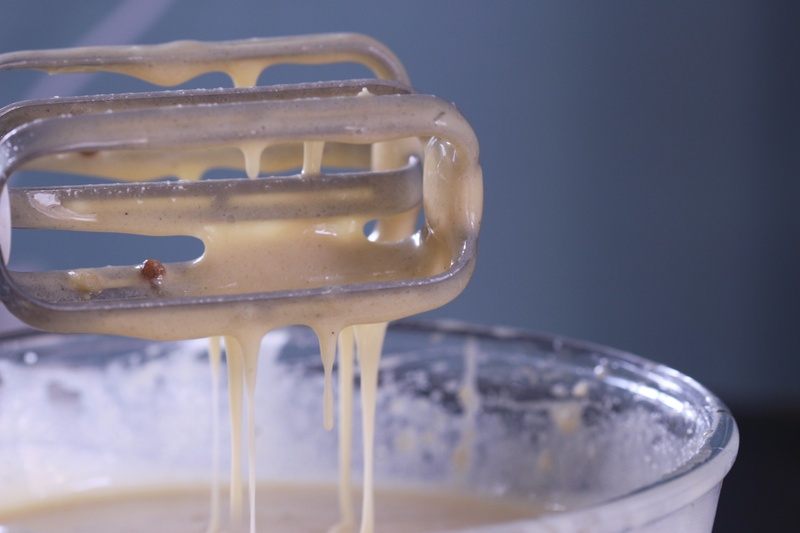 Beat with an electric whisk until pale and thick, then add the white chocolate mix and 1tbsp vanilla extract and whisk again briefly to combine. Then sift in 225g plain flour and fold in gently, trying to keep the mixture nice and fluffy. In another bowl (I just re-use the white chocolate one to save on washing up) beat together 200g cream cheese with 1 egg and 2 tbsp icing sugar. I consider the icing sugar here to be optional though, if you leave it out you will have more of a contrasting flavour to the blondie, but I prefer mine slightly sweetened. Line a 20cm square tin with greaseproof paper. Pour about 2/3 of the blondie mix into the tin, then add random splodges of the cream cheese mix, using about half the mixture and swirl together briefly with a knife. Sprinkle over about 75g raspberries before adding the remaining blondie mix. Top with the remaining cream cheese and again swirl together gently. Stud the top with another 75g raspberries. Bake for about 45mins on 150C fan until golden brown and just set in the middle. Allow to cool before cutting into squares. Due to the fruit and cream cheese filling I find this keeps best in the fridge, although allow to come back to room temperature before eating. I love tray bakes and will certainly try this one. Just looks so good.